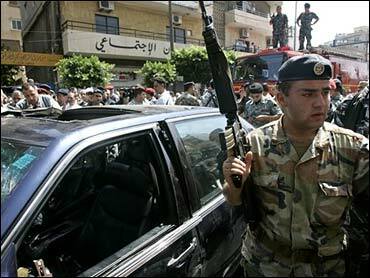 A bomb blast killed a politician who was a harsh critic of Syria's power in Lebanon as he rode in his car Tuesday, police said, the second slaying of an anti-Syrian figure this month. The explosion that killed former Communist Party chief George Hawi came a day after Lebanon finished elections in which the anti-Syrian opposition won a majority in parliament, breaking the hold of Damascus' allies on the legislature. Hawi's allies blamed Lebanese and Syrian security services in the assassination. "Yes, it's the Lebanese security system — the remnants — the tutelage," Farouk Dahrouj, another former Communist Party leader, said on New TV. "Tutelage" is a reference to Syria's influence in Lebanon. The opposition says Syrian intelligence agencies continue to operate in Lebanon and that Lebanon's own security services still have pro-Syrian elements, even after the Syrian military withdrew from the country in April, ending a 29-year presence. The opposition accused them in the slaying earlier this month of an anti-Syrian journalist, Samir Kassir, and the Feb. 15 car bomb that killed former prime minister Rafik Hariri. The June 2 killing of Kassir revived fears that Damascus and its local allies may be planning further assassinations to get rid of their opponents. Syria and the Lebanese government have denied any role in the slayings. Justice Minister Khaled Kabbani, touring the scene of Tuesday's blast, said the bomb that killed Hawi was detonated by remote control, similar to the one that killed Kassir. Hawi's car was moving, with Hawi in the front passenger seat, when the bomb went off in Beirut's Wata Museitbeh neighborhood, police said. Hawi was killed and his driver wounded. The explosive charges was put under Hawi's seat, police said. Hawi's face was visible and recognizable as his bloodied body was taken out of the car on a stretcher and placed in an ambulance. His Mercedes was cracked and buckled from the explosion. A worker at a nearby car dealership said he heard the blast and ran to the car to see what happened. Hawi's driver, slightly wounded, had run to the passenger side door and the two men tried to help Hawi. "Hawi was still alive and told the two of us, 'Help me, help me.' His face was bloodied, his abdomen was badly injured. Then he died," the dealership worker said, refusing to be named for fear of trouble with security services. Hawi's wife, ophthalmologist Sossie Madoyan, ran to the site, about 100 yards from her clinic, and fainted when she saw the carnage. "We are stunned," Prime Minister Najib Mikati said after hearing of the explosion. He blamed "conspirators" against Lebanon, saying that every time the country moves a step forward some attempt is made to destabilize it. He instructed security branches to investigate. Elias Atallah, a leftist opposition legislator elected Sunday, laid the blame on pro-Syrians. "It's because he (Hawi) was struggling against the military clique that is against the return of the Syrian intelligence to this country," he said at the scene. Hawi, a Christian, frequently spoke out against Syrian intelligence and interference in Lebanese affairs and against Syria's allies in the security forces. He was a prominent leader during the 1975-90 civil war, and his followers fought alongside Muslim and Palestinian militias against right-wing Christians. But Hawi in recent years distanced himself from the war and espoused Christian-Muslim dialogue. His communists in the 1980s were in the forefront of resistance to Israeli occupation in Lebanon. Syria dominated Lebanon for nearly three decades, until it withdrew its military in April, forcing it to rely on allies to maintain its influence. Damascus says its intelligence agents left with the troops, but the opposition says Syrian agents remain behind and are behind a number of bombings. Earlier this month, the United States said Syria has not fully withdrawn its intelligence operatives from Lebanon and that it was perhaps even organizing political assassinations. Syria has denied the allegations as a smear campaign by Washington.